IPCC Registration: After passing CPT, one needs to enroll in the next phase: CA Intermediate (IPCC). Here I have given CA IPCC Registration form & registration procedure by ICAI for May 2017 CA IPCC exam. The last date for IPCC registration for May 2018 is also updated below. CA IPCC Registration is not automatic and to register for CA IPCC, a CA aspirant will have to submit the IPCC Registration Form. A Student can appear for CA IPCC Exams after 8/9 Months of having submitted the IPCC Registration Form although the IPCC Registration Forms are accepted by ICAI throughout the year – the IPCC Exams are held only twice every year – i.e. in the month of May and November every year. So, for IPCC Nov 2017 attempt, you must have to register on or before 1st March 2017. Last date for IPCC Registration through Direct entry mode for May 2018 is given below, it is 1 month earlier than that of CPT route cut off registration through date. Please Note: To eligible for IPCC Registration, the Candidate should have either cleared CPT or have completed graduation with the required percentage. IPCC Registration form can be filled online from below given link. You can check the below page and proceed further by choosing new student if you have never registered with ICAI OR as existing student if you have earlier registred with ICAI for CPT. Following documents are to be submitted along with IPCC registration form. Also Check: CPT Pass Percentage June 2017. 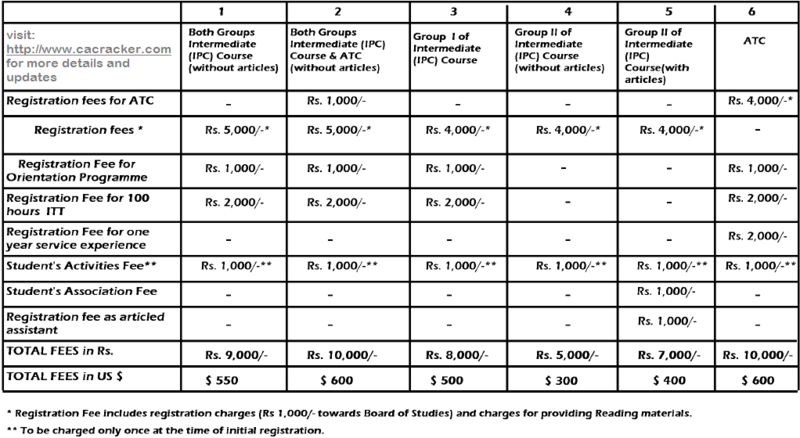 IPCC registration fees details is given in below table. IPCC registration fees are increased by ICAI every 2 – 3 years, so refer details in registration form applicable fees for registration. The Fees for IPCC Registration is payable by way of a Demand Draft/Pay Order drawn in favor of “The Secretary, Institute of Chartered Accountants of India” payable at Mumbai/Chennai/New Delhi/Kolkatta/Kanpur in accordance with the address of the Student. And IPCC Fees for direct entry scheme can be checked from the exam form given on above links. Check this too: For How many years your CA IPCC registration will be valid? The CA IPCC Syllabus consists of 7 Papers which are divided into 2 groups as under. Detailed IPCC syllabus is given on this article: so check: CA IPCC Syllabus for May 2018. BASIC INFO: Chartered Accountancy course is consist of 3 phases, i.e. 1st CPT (Common proficiency test) then 2nd IPCC (Integrated professional competence course) and 3rd and the last one is CA Final. So after clearing CPT examination, CA aspirant need to enroll for CA IPCC. To get enrolled in CA IPCC, you need to register with ICAI for IPCC again. The detailed CA IPCC Registration procedure and IPCC syllabus is explained here. You can apply for May 2018 and Nov 2018 exams by above cut off dates. A Student can appear for IPCC Examinations either group wise or appear for both the groups at the same time. To clear the IPCC Level, a Student has to secure a minimum of 40% marks in each individual paper of a group in one sitting and a minimum of 50% Marks in Aggregate of a Group to be declared as Passed. If you liked our article of “CA IPCC Registration Form, Procedure, Last Date Nov 2017“, then share it with your friends on Facebook. i forgot my date of registration. Is there any possible to know that ? I have send registration form to office for May 2017 attempt on 31st Aug but I didn’t get any confirmation letter yet so how I will come to know about confirmation? can we attempt cpt and ipcc in same year? as in june i’ll appear for cpt and nov for ipcc..
No, there must be atleast 8 months gap after you pass cpt. No. You can appear for ipcc only 8-9 months after you appear for cpt and clear it. I want to admission on ICAI Nov 2017, but I am not able to connect ICAI online Registration form. please send me a valid link for registration on IPCC. I was already registered under WIRC and i was allotted with WRO No. But it has expired as now. So I need to get register again to appear for IPCC under direct entry scheme as before.Will I be allotted with the same registration no. or a new registration no.? Kindly let me know the procedure and fees and anything else with regard to the same. I’m in bcom final yr can i registered for IPCC as provisional registration…. Plz provide me information..